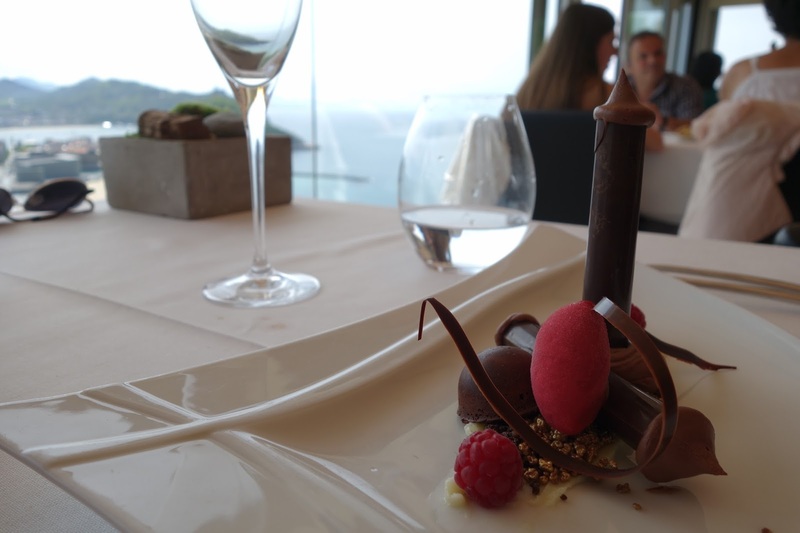 To make the most of our weekend trip in San Sebastián, we booked lunch at the 1-star Mirador de Ulia. 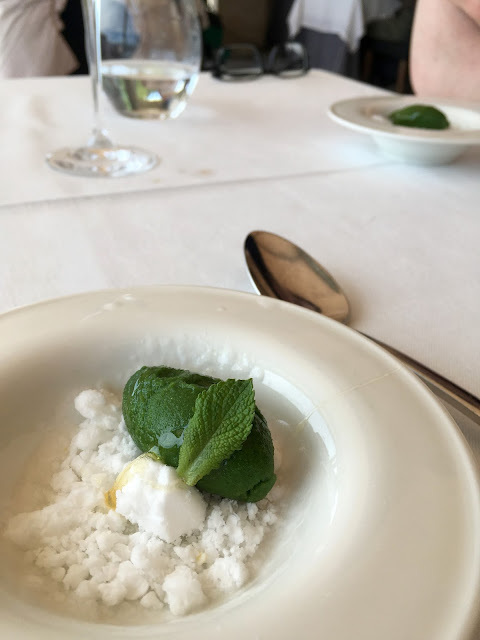 It would be way too indulgent to have two 3-star meals back-to-back, and Mugaritz was booked out. We decided to work up an appetite by walking up to the hillside restaurant; including the wandering around town, it was a good 1.5hr walk. We felt slightly underdressed when we were shown to the table by the window in the conservatory. Thankfully other diners were more casual than smart too, except for a group of Asian ladies that wore bridesmaid-style dresses. We were offered a lemon and brandy welcome drink, which was so refreshing after walking in the heat. We took a long time deciding between the tasting menu and a la carte. The oyster with champagne was only available on the tasting, and it had the lobster and tuna belly that I wanted, but I couldn't care for the asparagus and duck; I really wanted to try the cod cheeks too. Ended up a la carte with a bottle of vintage cava. 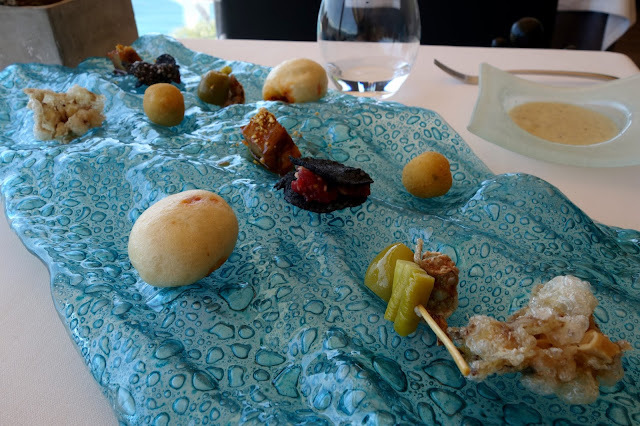 The amuse bouche selection was very intriguing; we started with the soft mini bun stuffed with chopped chorizo served with the mushroom velouté, then the pressed chicken wing and crispy ball with explosive runny purée. The puffed chicken feet cracker lined with a layer of pâté was one of my favourites, as was the slightly sweet olive with a smear of anchovy. The lobster pile was muscular and succulent with its sweet oceanic juice, perfectly cooked to retain a marginally creamy centre enveloped by bouncy lobster meat. The delicate fragrance from yuzu pearls highlighted the natural essence in the lobster, simply seasoned with gentle herb foam. It was immensely satisfying. 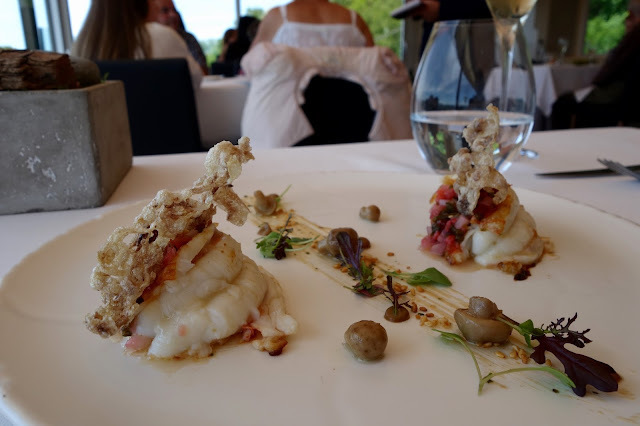 I love cod cheeks, it's the softest part of the fish, contrasted with some toasted fish skin brittles. The txakolí (local fizzy wine) jelly was served at the table and I can't tell you what it tasted like. Making it into a jelly took out all the gas and so it was just cubes of jelly with a mild alcoholic aftertaste. 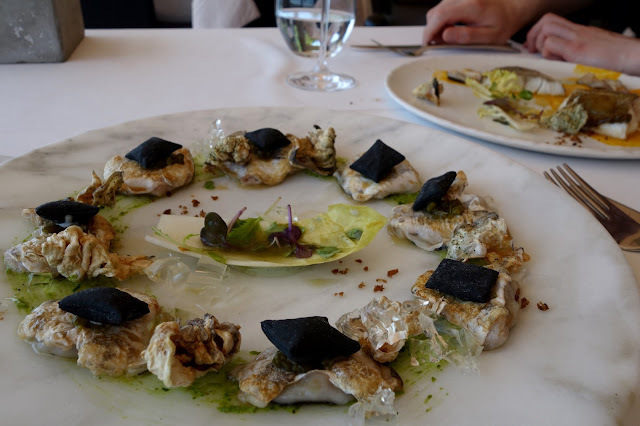 The fish morsels were lightly torched to leave the skin crispy with slight charring, topped with a puffed cracker filled with creamed-garlic. Although the cheeks were very enjoyable, I felt this dish was lacking some sauce. 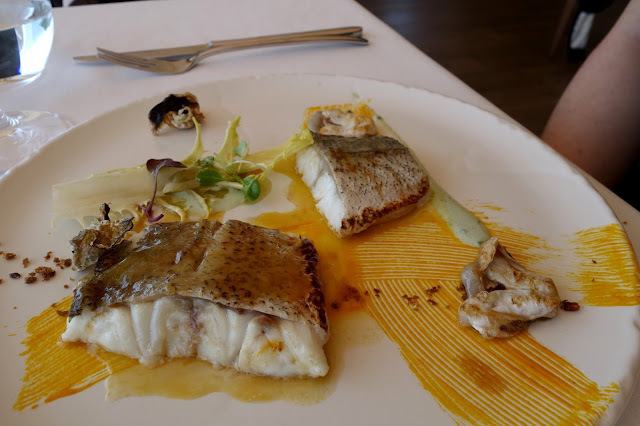 Its hard to be impressed by a hake fillet after the one we had in Akelare the night before. Though perfectly cooked and deliciously silky, it just didn't have that je-sais-quoi. Very good, not extraordinary. I was so excited to see this on the menu, and it certainly didn't disappoint. 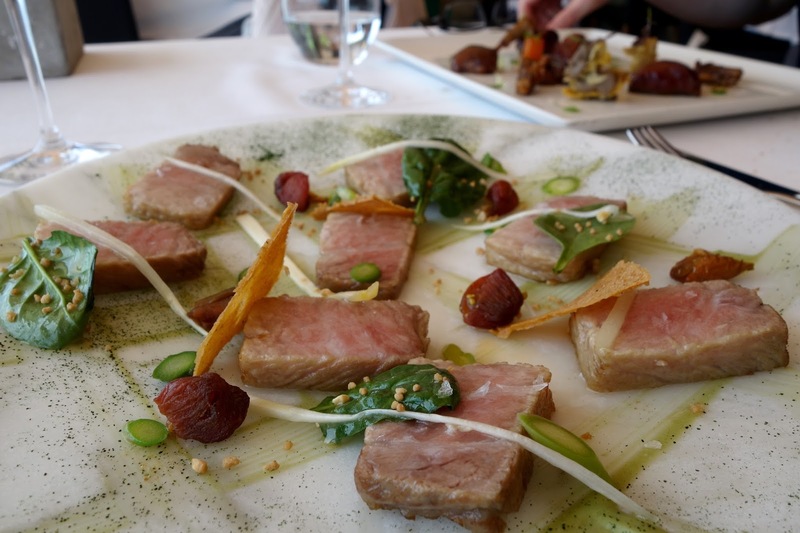 The slithers of tuna belly were flash-seared on the outside so that the centre was still raw but the glorious fish oils were melting. The tuna belly was at its optimal state. Unlike the clean-tasting o-toro sashimi, the searing brings out the fishy flavours, which was quickly washed away as the slice of fish melted in mouth, releasing its mind-blowing fish oils. The dried cherry tomatoes scattered on the plate are worth mentioning; the sugars concentrated in a tiny pocket with a chewy texture. No doubt one of the best dishes on this trip. 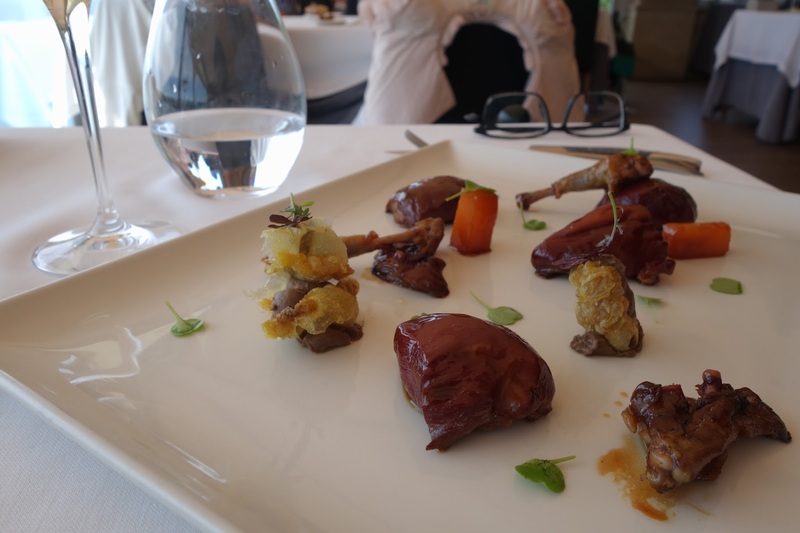 The pigeon has been spread over the plate, in an artistic way. The meat carried powerful flavours, as well as the mild metallic tone from the game meat, it had an earthy tinge from the gizzard jus, nicely balanced by the sweet pumpkin wedges. My favourite was the whipped liver parfait on the light airy crisp; there were all kinds of textures on the plate. Delicious. Popping candy is the best! We preferred this one, the crispy shells were buttery, bursted with delicious cream in mouth. We thought we would probably be unfair to Mirador de Ulia having had our 3-star dinner at Akelare the night before; inevitably the bar was set a tad higher than usual. That said we thoroughly enjoyed our lunch at Mirador de Ulia. The food was meticulously prepared and showcased a vast range of techniques. 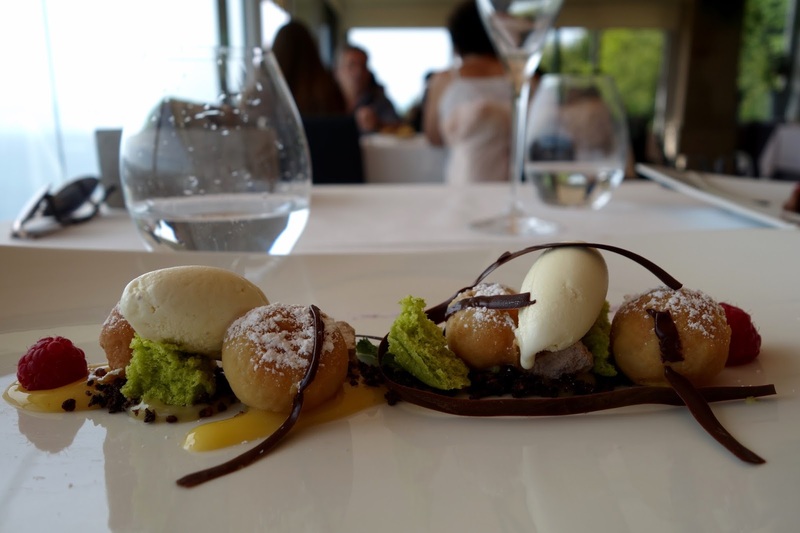 Each dish was designed to bring out the flavours of the ingredients, showing off the quality of the produce. Undoubted one star quality. And of course, the panoramic view over the beach and the city was quite extraordinary.